Join us for our June craft night as we make vodka infusion bottles and confetti shot glasses. 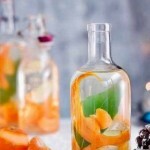 In this class you will make your own infused vodka bottle (750 ml) using farm fresh ingredients. You can mix and match our infusion options to come up with your own special infusion. After the class you can add your own vodka to your infusion bottle. We will also be making two DIY shot glasses. The cost of the class is $35 and includes a house glass of wine or a draft beer. To sign up send us your email and we will send you an invoice. We don’t offer refunds but if you sign up for the class and can’t attend we can make the crafts for you. We hope to see you at our June craft night! !